He’s been on Iron Chef and Martha Stewart. He was named “Best Chef in the Southeast” by the James Beard Foundation.We travelled 8 hours for the opportunity to meet with Husk Restaurant Executive Chef Sean Brock, a fellow hillbilly who shares our passions of heirloom gardening and cooking with fresh local ingredients. “I believe I was born to preach the gospel of Cornbread, Grits and Whiskey” one cannot help but to become a disciple. He speaks in a soft easy rhythm. Describing his Grandma’s garden, it’s as if he has grabbed your hand and taken you to a magical place in Appalachia, where muscadine grapes drape across the swing, greasy back beans grow in the garden, and where folks live a simpler life valuing food and family. 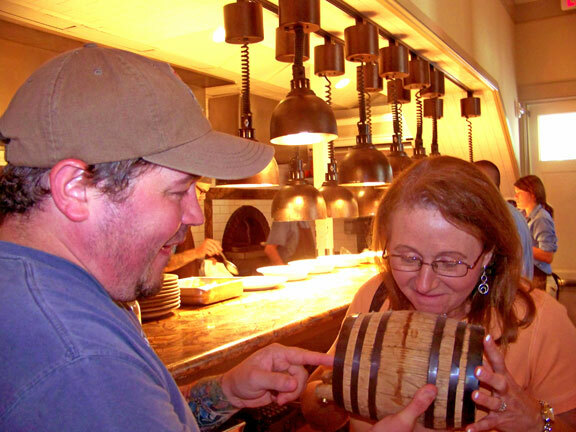 Sean Brock’s training as a chef might as well have been the instruction of evangelizing. His passion for food, his commitment to resurrecting long forgotten vegetable varieties, his spiritual connection to the hills of Appalachia resonate with every word, every work chef Sean Brock undertakes. Brock is fanatical about ingredients. He grows out heirloom seeds to establish enough seed stock so that he can share with local growers. At Husk Restaurant the menu changes daily reflecting what is in season, what the farmer has at this very moment. If he sees tomatoes that are beautiful, he buys them. hat doesn’t appear on the menu, gets put up in mason jars for later use. Growers for Husk are all regional and southern. Folks like Thackeray Farms and Border Springs Farms are on Brock’s speed dial. When Sean Brock holds an heirloom tomato in his hand, it’s as if he’s a little boy just presented with a miraculous gift. One can almost hear his mind whirling underneath his Southern Foodways Alliance cap. Where did this tomato come from….what’s it’s history, what’s it’s story? How will it taste? What can I do with this jewel, to showcase the flavor, the freshness, the sense of history. Husk Restaurant Charleston SC The Destination in New Southern Food! Stunning article Joyce. You really captured Brock’s joy about ingredients and the south. “I believe I was born to preach the gospel of Cornbread, Grits and Whiskey”. Ha! Awesome! Great article, Joyce. He sounds like my kinda man! 🙂 Aren’t Cornbread, Grits, and Whiskey the three food groups?? Brock’s cornbread made it to a “Best thing I ever ate” episode. Cornbread here in the mountain is something we take for granted. We kinda laughed about the cornbread thing. But for the rest of the world, who doesn’t know the pleasures of a hunk of bacon flavored cornbread….it’s a great starting point for new converts. Giggles Color me a Brock disciple. Bill, coming from you that is HUGE. Thank you. we are trying to juggle our schedule for a trip to Berea….hopefully to see you and your project. I already have a name for the piece, “Saving Appalachia One Seed at a Time”. What do you think? Hey Shellie! Good to hear from you. Y’all if you don’t go read Shellie’s blog http://www.allthingssouthern.com/ All Things Southern, well you are just missing out! Hi Joyce! I’m new to your blog by way of the KY Food Bloggers group on FB. I was intrigued when I saw you were from Pikeville, as both my husband and my father are from your neck of the woods (Belfry and Jenkins, respectively). As I was perusing your posts, I had to stop when I saw the name Sean Brock. We just got back from Charleston about a month ago, where we were fortunate enough to eat at both of Chef Brock’s fine establishments. You captured him and his style of cooking perfectly in this piece. I’m only a tad jealous that you actually got to meet and converse with him! How did you arrange that one?! Here are my 2 posts where I reviewed the dining experience at both places. Such a treat! Danielle, thanks for stopping by. When I get discouraged, or feel I have lost focus, I go back and play my Chef Sean Brock interview. Like Brock, I love my Appalachian roots and share his passion not only for good food….but for growing heirloom vegetables. Thank you for sharing your links, and best of luck in your food blog journey.